The Friendship Club, which is run by volunteers operating from the Church of Scotland Centre in Glencruitten Road, brings together a diverse group of people, mainly elderly, for companionship and stimulation. The group meets fortnightly with a variety of activities available including exercises, readings and communal singing with guest artists appearing and the group also attends local events. 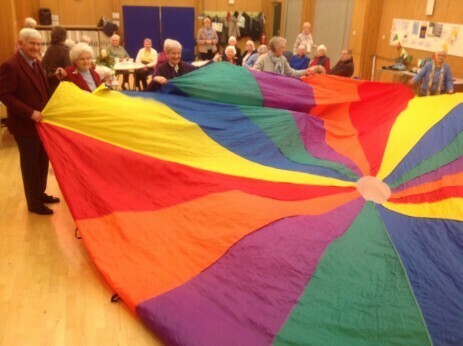 The Rotary Club of Oban recently covered the cost of an exercise parachute for the Club and President Iain Mac Intyre is seen here participating in a demonstration of how the parachute works. The Rotary Club of Oban, through its fund raising activities, is committed to supporting its local area at all levels across a wide section of the community.